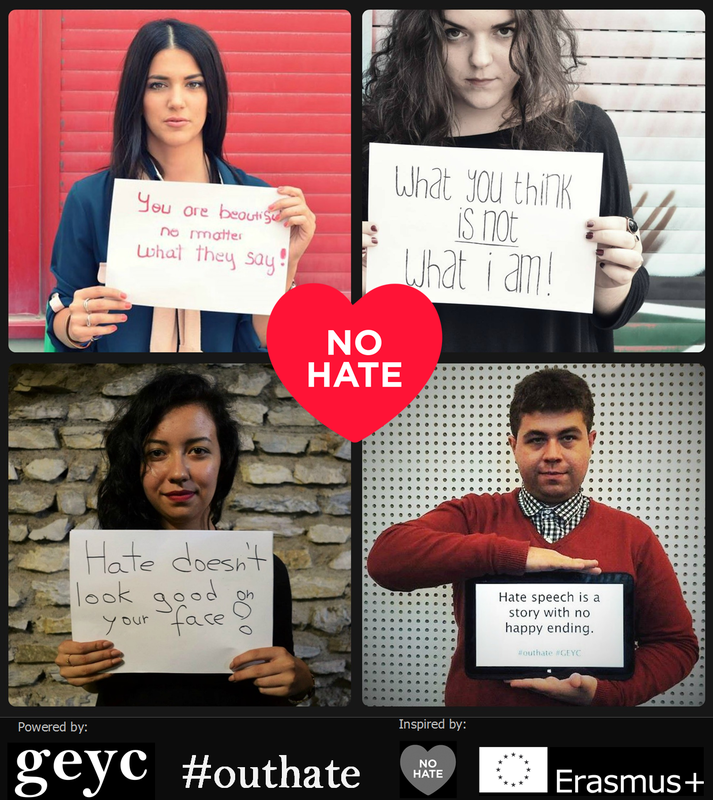 In July 2015, Group of European Youth for Change launched the call for the selection of three European Fellows in Human Rights, in the frame of No Hate Speech Movement, for a three phase chain-project (7 days Training Course on Human Rights in Bulgaria - Implementation of activities in Romania – Dissemination of the results in Georgia) that lasted from August until December. After a competitive process Ana-Maria Andreea LUPU, Georgiana NUȚU and Cristina Elena PETCU were the ones who stood up as the most passionate, active and knowledgeable in the field of human rights, and thereby, they were selected to become the European Fellows in Human Rights. 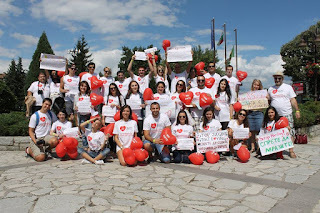 The project was implemented together with the organizations Alternativi International from Bulgaria and DRONI, from Georgia in the frame of an Erasmus Plus project. This article represents a brief summary of their work during these months. “We were trained in Bansko- Bulgaria, during an intensive 7 days course on human rights and no hate speech, together with participants from 9 other countries like Macedonia, Bulgaria, Georgia, Moldova, Estonia, Poland and Turkey, including some with a recent conflict past, such as Armenia and Azerbaijan. We were introduced to specific key terms, as defined by the Council of Europe, that can be encountered when dealing theoretically with no hate speech and we learned how to differentiate between them: refugee, asylum seeker, migrant, immigrant, ageism, ethnocentrism, minority, advocacy, hate crime, human rights, political rights, cultural rights, economic rights, prejudice, stereotype and others. We discussed best practices and creatively dealt with study cases, we performed in teams and we were introduced to non-formal games to better coagulate the whole group. 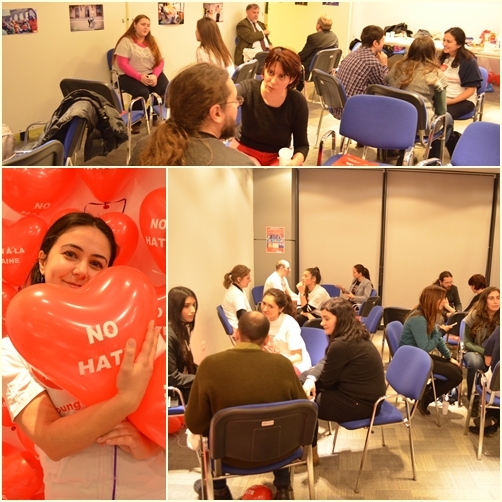 We learned about specific ways on how to organize no hate speech campaigns and got our first introduction to the concept of Football against Racism and on how to create a Human Library, to name just a few. We also watched films with a powerful visual impact which were made to create awareness on hate speech. One specific night that was dedicated to a no hate speech film targeting hate in northern Europe was unforgettable as it inoculated in us the motivation we needed to fight against hate, back in our countries. As a direct outcome of this first training course which took place in August 2015, and in the frame of the fellowship, all the participants formed national teams and created parallel events in their home countries in regards to combating hate speech. The outcomes were disseminated in Tbilisi, Georgia in December 2015, where we got a first-hand knowledge on the Caucasus culture.Considering the fact that Romania is a former communist country, people nowadays tend to be very limited when it comes to interact with other nationalities, or with the minorities that we have, particularly Rroma and Hungarians, but also with vulnerable groups such as LGBT or disabled people. 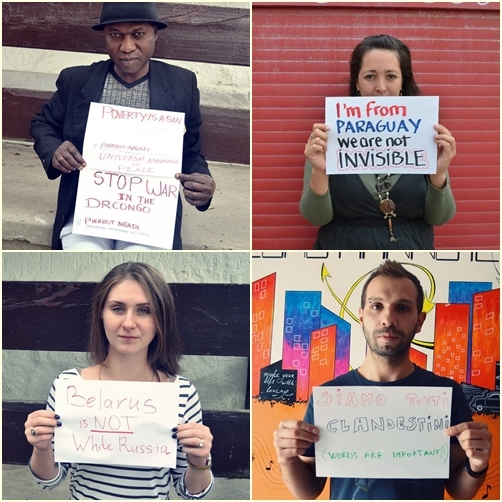 However, these hostility issues are present all around the world, and consequently the Romanian team decided to elaborate a campaign with no borders, aimed both locally and internationally. Thus, OUT HATE Campaign was born, with two main directions: an online photo-video framed activity, with an international flavor named ART OUT HATE, and an activity aimed locally, entitled The Living Library of Stereotypes, which was the first of its kind implemented as such in Bucharest.The ART OUT HATE Campaign emerged from the faith we have in the power of nowadays visuals that can provoke questions, trigger reflections and inspire concrete actions as a counter narrative to hate speech. Our objectives for ART OUT HATE, were to raise awareness about hate speech in the online and its risks for individual young people, to support and show solidarity to people and groups targeted by hate speech online, to develop youth participation, stimulate youth creativity, and to generally support young people in standing up for human rights, and for no hate speech movement in particular.We created a methodology that we launched in the online under the following link: geyc.ro/art-out-hate, and we encouraged people from Romania and from around the world to photograph themselves with a descriptive, catchy line, against stereotypes, divisive, discriminatory and hateful situations, that they themselves experienced, based on skin color, ethnicity, nationality, gender, sexual and religious orientation, or against any other hatred situation that has touched them deeply enough for them, to want their opinions to become heard and seen. All the participants posted their pictures available to the public in social media, using the statement " I stand for human rights online. I challenge you to do the same". We decided on this statement, since we wanted to create a roller-coaster effect and get as many people as possible to react to our campaign and to actively engage in it. We also encouraged the participants to be as creative as they could with the photographs, and so we received statements from all over the world: UK, Congo, Paraguay, Italy, Spain, Romania, Portugal, Albania, Hungary, Russia, Belarus, Georgia, Turkey, Croatia etc. 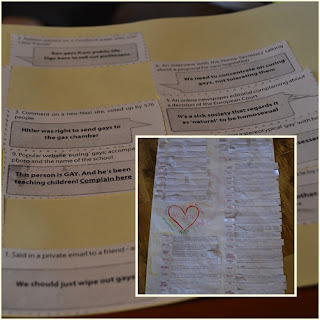 All the entries were very moving and we were absolutely impressed with the variation of statements and "cultural richness” of stereotypes and hatred portrayed by the participants, as they were all different depending on the area they were coming from. We also received some photos depicting the refugee situation nowadays. We created the "outhate" hashtag. We also worked a lot outside the online campaign, in the sense that we promoted it offline and sometimes we took pictures of participants in other events locally and internationally. Our first pictures were taken during an AIESEC National Conference. In September, we had the occasion to take pictures and film Romanian and Italian participants during a youth exchange in Calabria, Italy. During an Art & Human rights Conference in Budapest, Hungary, with UNITED, we also took pictures and filmed for Art OUT HATE. 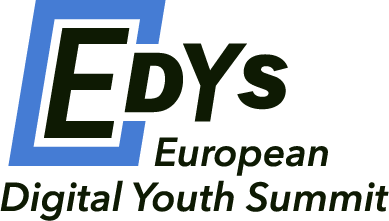 All throughout the campaign we collected the pictures, we personalized them with a bar that included the main logos of the campaign, and we posted them in an album on GEYC Facebook page. 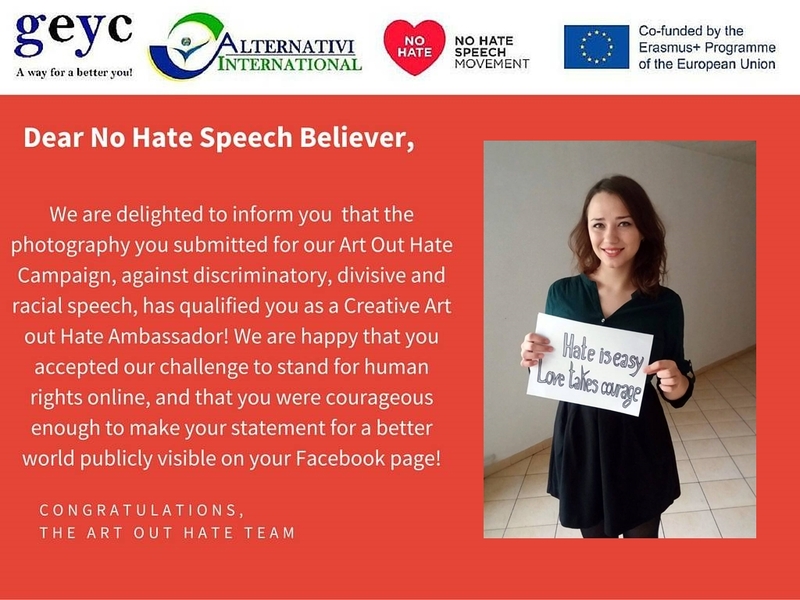 At the end of the campaign the participants received a congratulation creative letter, which appointed them as ART OUT HATE AMBASSADORS. The second activity we found beneficial to organize at a local level, in Bucharest, is the Living Library event. As we looked to the main roots of hate speech in Romania we realized that one of its causes is the lack of socialization between people pertaining to different types of groups. People tend to trust more what media sells, without checking the information or without looking deeper at the problem, and consequently they start cyberbullying or spread hateful speech about certain people coming from different 'categories'.Therefore, as ambassadors for human rights, we found beneficial to organize a Living Library of Stereotypes, a living library event whose main goal was to promote respect for human rights and human dignity, by challenging prejudice through fostering constructive dialogue about stereotypes that frequently lead to discrimination against individuals or groups. The Living Library of Stereotypes was used as a tool to facilitate conversations between people coming from different social layers, with various sexual orientations, with different religions and ethnicity, and to reduce the fear and the bias of the other, by encouraging people to ask questions in a suitable and controlled or supervised environment. It provided a way to listen to the stories of the ones that they usually do not want to hear, either because the 'others' are outcast or because society formed in a way that did not allow such interactions to happen. The Living Library was a prime example of contact-based prejudice reduction. Its methodology was based on facilitating the conversation between two persons: the Book and the Reader. The Books were volunteers, who were either subject of discrimination or who represented a group of individuals from our society that are subject of stereotyping, prejudices, hate or discrimination.The Living Library of Stereotypes was organized on 10th of December 2015, the day when we also celebrated the International Human Rights Day, and it brought together 35 readers aged between 21-60 years old and 8 books from the following areas: LGBT, Rroma community, People with Disabilities, Refugees, Politicians and Philosophers. The auspicious environment, the openness and amiability of the Books made all the participants eager to have conversations not only with one specific Book but with almost all of them. 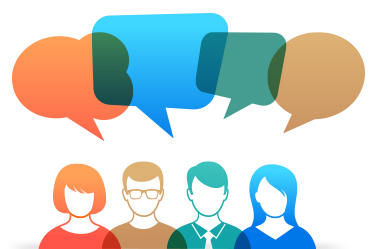 The feedback received was generally positive and the participants were keen on the idea that a precedent in such events should be created, as they expressed a need for it in Romania.